Finding a Great Summer Camp In San Diego Isn't as Hard as it Seems. We've Made it Easy for You With the San Diego Camp Fair! When it comes to choosing a summer camp for your child -- in San Diego or anywhere else -- you don't want to make a mistake. After all, your child's been working hard all school year to stay on top of their homework, get good grades and deal with all the other stresses and situations associated with a typical school year. The good news is, summer is coming, so it's the perfect time for your kids to take a break from all that. For most San Diego families, that means sending your child to camp where they can have a blast with their friends, create lots of fun memories and enjoy the summer until the school year rolls around again. Of course, in order to help your child make the most of their summer experience you need to pick the right camp. In greater San Diego, there's a wide variety of camps to choose from depending on your child's interest. But if you're like most parents, sorting through the available options can get frustrating and confusing, not to mention time-consuming as you spend endless time doing Internet research or calling all the camps on the phone one-by-one for information. Then, once you think you found a suitable program, you start second-guessing yourself if you've actually found the best one. Never fear, though, because we've got you covered! The San Diego Camp Fair is your solution to finding the best camp for you! If the challenge of finding the best San Diego summer camp is getting you down, you don't have to worry anymore because we've done all the research and hard work for you. We're bringing all the best San Diego summer camps (and several others from out of town) together in one place so you can meet all the camp representatives in person to help you make a decision. This all happens at the San Diego Camp Fair Saturday, February 23 in the Casa Del Prado building at Balboa Park. Over 50 different summer camps and programs are exhibiting at the Camp Fair where you can go booth-to-booth gathering free brochures and talking face-to-face with all the various camp directors from San Diego and elsewhere. Meeting all the camp representatives and getting all your questions answered in person probably sounds a lot better than spending time on all the different camp websites, requesting brochures to be mailed to you, and talking to each camp representative on the phone, right? After all, nothing beats a face-to-face meeting to get a really good sense of all the available program options and, most importantly, the people running them. 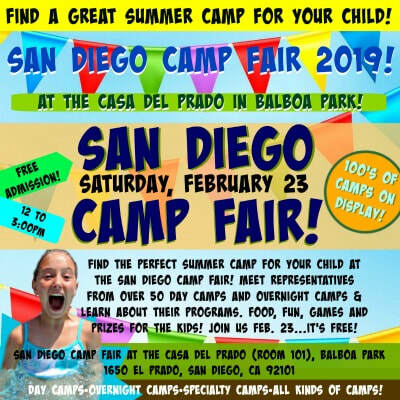 Attending the San Diego Camp Fair is your best opportunity to learn about all the upcoming 2019 summer camp and program offerings for your kids, and it all take place conveniently under one roof. Best of all, it's entirely free! 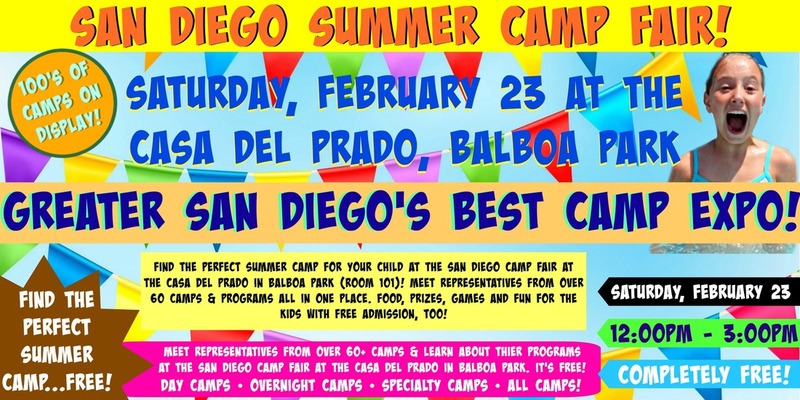 So mark your calendar now for Saturday, February 23 and we'll see you at the Camp Fair in San Diego! Price: Free! Get your free tickets today before they're gone. Limited supply going fast! Kid Friendly? YES! We'll have lots of food, fun, games and activities so bring your family, kids and all your friends to the San Diego Camp Fair. See you there!